One Year Ago, Monday, I finished my rough draft. When you sit down to write a novel, the novel seems like the biggest thing ever. You have an idea, maybe even a plan on how it’s going to happen. But there’s over 100,000 words between you and it. Everyone writes differently. I found word count was a good way to keep my progress going. Even if I didn’t feel like it, I would push through and get my words for the day done, knowing I could edit it later. Starting with 1,333 words per day for my kick-off month of NaNoWriMo (national novel writing month). The goal for NaNoWriMo is to write 50,000 words. It’s a great start and there’s a supportive community of people all writing towards the same goal. (A standard YA (Young Adult) novel is 50,000-80,000 words. A standard fantasy novel is 80,000-120,000 words.) After taking December off, I lowered my goal to 10,000 words per month. 2,300 words a week is a much more sedate pace, and let me have a life outside of writing. A little reading, a bit of the gym, the ability to see my friends and family. And I made it. I finished my novel after 10 months. 9, if you recognize that I took December off. Yet, here it is, a year later and I’m STILL editing. It sometimes feel like I’ll never be done. Editing is harder to quantify, deciding when you are done is arbitrary. Like recognizing the obscene, you know it when you see it. Or, when you just can’t look at your novel any longer. But, my newest beta reader only read the first third of the novel. So, once I finish this revision draft, I’ll be sending back out to willing beta readers, to see what they think of the edits. I imagine there will be a 4th round of edits from there. Depends on how large the edits from that are. 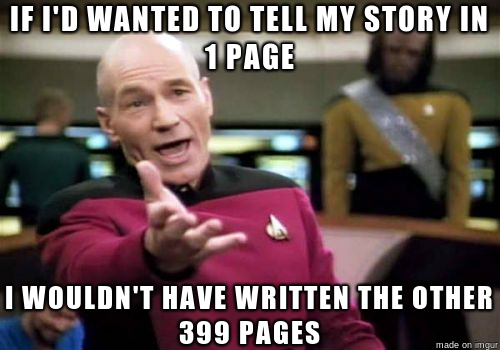 It will be either time for a copy-editor (sentence structure, punctuation, etc) or time to start submitting the novel to agents and publishers. Am I done yet? Now? How about now?! Q/A : Why Did You Write Demon Marked? For me, Demon Marked came to me in a dream. Literally. Just a few key images that I wrote down when I woke up, years and years ago. I wondered about that world. I wondered how my girl got there. I started to write the story more than twice. It percolated for years. Finally, I managed to commit to writing and finished the story. What kept me going? Why did I write Demon Marked? I needed to know what happened. Who was the man in her dream? How did she get to the cliffs? How would she rescue [REDACTED]?! If I didn’t write it, I would never know what happened. I’m a plot driven reader and that’s why I write. I try to make sure I have a visual world for my readers, but my imagination is typically more conceptional, or tactile. Sometimes, my story ideas come from wondering “what if…”, sometimes they come from brief images I dream, but always, I write to find out how we get there from here. Q/A Wednesday: What’s a Query? While awaiting final feedback (and not trimming the rest of my novel), I’ve been fine-tuning my query. There are many websites and resources that speak far more eloquently than I, but in short, a query letter is what you send to an agent or a publisher to entice them into representing or publishing your novel. They say to keep it under a page. Captain Picard understands the struggle. Step One: Always address it to a specific person. Step Two: Launch into your basic novel facts (“word count”, genre, title) and your hook. Hone your hook to a sharp point. Make it intriguing and unique in all the world. Step Three: Give a short synopsis paragraph or 3, similar to a book blurb, but giving away a bit more plot than that. This is hard. This is astronomically hard. Step Four: Mention a little about yourself and name any writing accolades you may have. Read up on the agent or editor you’re submitting to and tailor your query for them. Selecting an agent is another post, but don’t just create a form letter and blanket every agent. Feel free to write a sentence or two at the beginning of your query about what drew you to this agent/editor- did you meet/talk with them? Do you follow their blog? Do you enjoy the other authors they represent? This is my first time writing a query letter. Lilyan has a sister to save, in the last place she ever expected to see.